Purdue's brutal schedule continues on Saturday against Northern Illinois, a team that amazingly played in the Orange Bowl last year. I'd love to look up when the last time Purdue was the underdog against a MAC team, but that seems like a lot of work for something that may have never happened. If anyone wants to research it, leave the answer in the comments section and we'll let you write our first ever tweet. Signs that don't use the first letter on each line are just lazy. 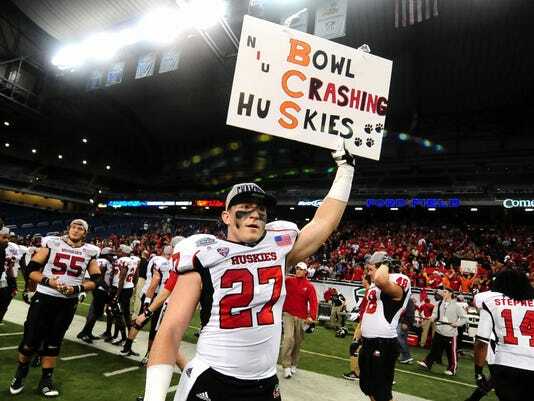 Northern Illinois may still have Jordan Lynch, but they also have one of the worst defenses in the country. Most recently, they gave up 39 points to Eastern Illinois - an FCS school (albeit the 8th ranked FCS school). This is just what the doctor ordered for Purdue's sluggish offense. Along with the come from behind win over Eastern Illinois, the Huskies scored 10 points in the last 6 minutes to beat a bad Iowa team and struggled to a 45-35 victory over an Idaho team that lost 40-6 (!) to NORTH TEXAS. If the Boilermaker defense can play like they did against Notre Dame and somehow contain Lynch, the offense should have a field day against a very beatable Northern Illinois team. Wait, did I mention Jordan Lynch yet? This guy does everything. He averages 220 yards passing and 135 rushing yards per game and it wouldn't be a stretch to think he could break 200 yards on the ground against the Boilermakers. If the Huskies can capitalize on a couple of turnovers and the Boilers miss even HALF the tackles that they did against Wisconsin last week, the Huskies win by double digits. Cameron Clinton-Earl is a little-used defensive end, but that doesn't keep him from looking like a creepy version of Samuel L Jackson. If we see this guy's mug, we're in deep trouble, because it definitely means that there are motherf#@!ing snakes on this motherf#@!ing plane. The Huskies are favored by 3.5. I'm embarrassed for Kirk to even look at the standings right now, so I'm not going to tabulate the betting totals at the moment. All you need to know is that he's 0-4 and I'm 3-1. I don't think you're going to like who Kirk picked. This week we'll bet the number of total points we're expecting the teams to score this week. I got my Indians playoff tickets in the mail today. While the likelihood of me actually getting to use them is less than 1%, how cool is it to have a ticket in my possession that says "World Series Game 7"? I don't think anyone receives playoff tickets without staring at that ticket for a few seconds just wondering what a game like that would be like. I have no random stories that don't have anything to do with the game for Kirk. 1. Donnie Hale is transferring. I have to admit that I'm personally kind of shocked that a kid who went to a year of prep school and then redshirted his freshman year would only end up playing one year for the school he waited to play for. We'll see where he ends up, but with Anthony Johnson, Sandi Marcius, and Jacob Lawson also not returning, this year's basketball team is going to look quite a bit different from last year's young and relatively disappointing group. 2. While it seems ridiculous to think about, Purdue can still possibly sneak into a bowl game this year. If they want to even consider it, though, they MUST win this weekend's game. Iowa, Illinois, and Indiana are all very winnable games. That leaves 1 win out of Nebraska, Michigan State, Ohio State, and Penn State. Hey, it could happen!